“See you in Bologna” - this is the typical way children's books professionals say goodbye to one another. You can hear it echoing in the different languages spoken at the Bologna Children's Book Fair every year, an unmissable event, a must for those working in the children's publishing industry, who have been gathering every year for more than half a century. With more than 26,000 visitors every year, the fair attracts a lot of keen professionals – it is not open to the public – over four wonderful crazy days. 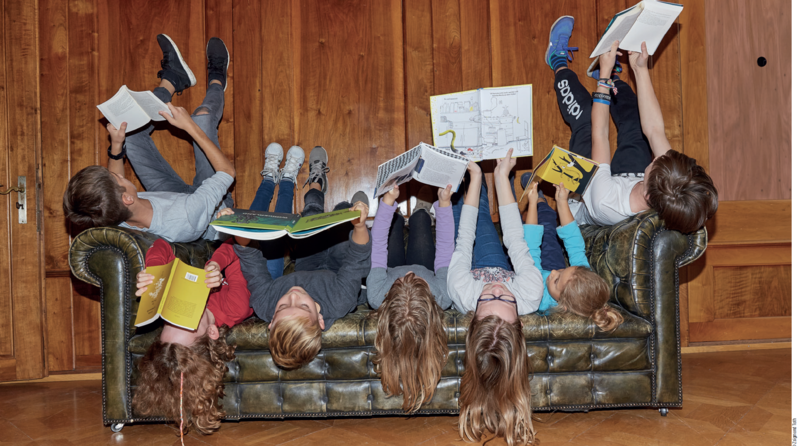 It represents a major event for publishers, authors, illustrators, literary agents, book distributors, teachers, translators and anyone working in the children's publishing industry. The famous wall where illustrators display their works in the hope of getting noticed is as important as the fact that this fair is the most remarkable event on the trading of publishing rights worldwide – creativity and business blend together in a powerful mix. 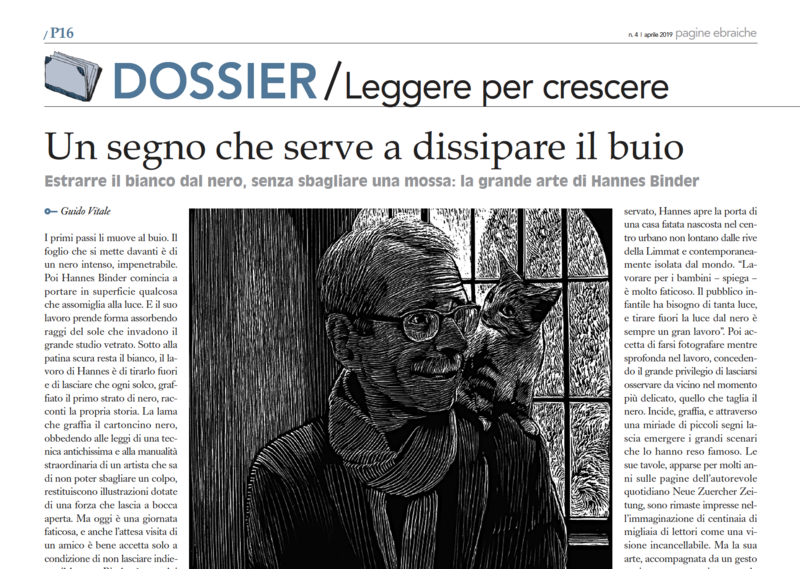 *The article was published in the special section Leggere per crescere (Reading to Grow). Translated by Sara Facelli, with the help of Claudia Azzalini, both students at the Advanced School for Interpreters and Translators of Trieste University and interns at the newspaper office of the Union of the Italian Jewish Communities. He moves his first steps in the dark. The sheet he puts in front of him is intensely, impenetrably black. Then Hannes Binder starts to raise to the surface something that looks like light. And his work takes shape absorbing the sunrays that are flooding his spacious, glass-walled studio. Underneath the dark patina lies a white layer – it is Hannes’s task to extract it and to let every white groove tell its own story once the first black coat has been scratched off. The blade scraping the black cardboard produces astonishingly powerful illustrations, resulting from an ancient technique and from the extraordinary handicrafts of an artist who knows he is not allowed to make mistakes. Today is going to be a hard day, even an awaited friend is only welcome if he doesn’t make him fall behind schedule. Binder is one of the eminent Swiss artists representing the Confederation in Bologna. Right after finishing the breath-taking scenery honouring his fascinating, unique Zurich, along with Kurt Guggenheim’s masterpiece Alles in Allem, set in the 19th-century Jewish society, it is time to hand in the book on the Second Ark. *The article was published in the special section Leggere per crescere (Reading to Grow) in the April issue of Pagine Ebraiche. Translated by Claudia Azzalini with the help of Sara Facelli, students at the Advanced School for Interpreters and Translators of Trieste University and interns at the newspaper office of the Union of the Italian Jewish Communities. Hace unos días, durante una conferencia en el Forte di Bard (un conjunto monumental situado en las alturas de la aldea de Bard, en la región del Valle de Aosta) nos preguntábamos por qué muchos de los italianos que, en un principio, ante las leyes raciales, no habían hecho nada para defender a los judíos, salieron más tarde a defenderlos, sobre todo a partir de la ocupación nazi, en circunstancias mucho más trágicas y peligrosas. *Anna Foa, historiadora. Traducido por Arianna Mercuriali, estudiante de la Escuela Superior para Intérpretes y Traductores de la Universidad de Trieste, de prácticas en la oficina del periódico de la Unión de las Comunidades Judías Italianas. “Words can become like little doses of arsenic: ingested unconsciously they might seem of no consequence, but after a while the toxic effect emerges,” (Viktor Klemperer, The Language of the Third Reich). What language are we speaking? 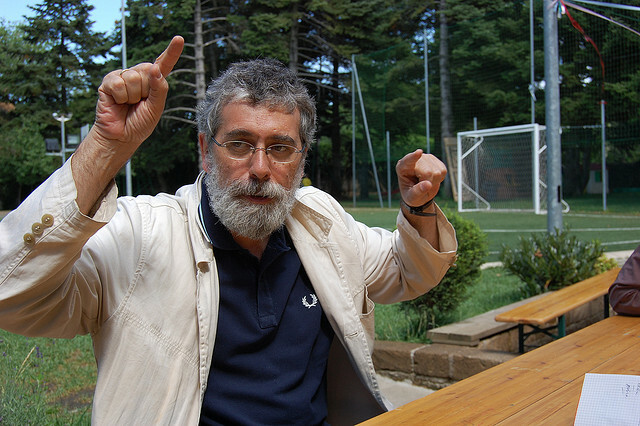 *David Bidussa is a historian of social ideas. There could be no more appropriate period than Passover to turn the spotlight on one of the rarest and least known of Hebrew illuminated manuscripts: the Lombard Haggadah. Produced in Milan in the late 14th century, it is the earliest standalone Italian manuscript of this text, which tells the story of the flight of the Israelites from Egypt as chronicled in the Book of Exodus. The text sets the order of the Seder, the ritual meal shared on the first night of Passover, and its reading at the Seder table fulfils the commandment of the Torah to recount and deliberate on this day on the story of deliverance from slavery under Egypt’s pharaoh. Not seen in public for more than a century – it was last exhibited at the Exposition Universelle in Paris in 1900 – and absent from any of the major studies of illustrated Haggadot, the manuscript is to be unveiled at the New York gallery of dealers Les Enluminures on 12 April and will remain on view until 20 April. As well as a gallery talk (13 April), the show will also be accompanied by a public lecture (10 April) and conference (14 April) at, and co-sponsored by, Fordham University, and an illuminating scholarly monograph (Paul Holberton Publishing). One of only three illustrated manuscript Haggadot remaining in private hands, it is also for sale – for an undisclosed ‘mid to upper seven-figure sum’. *The article was published in the magazine Apollo on April 10, 2019. This newsletter is published under difficult conditions. The editors of this newsletter are Italian journalists whose native language is Italian. 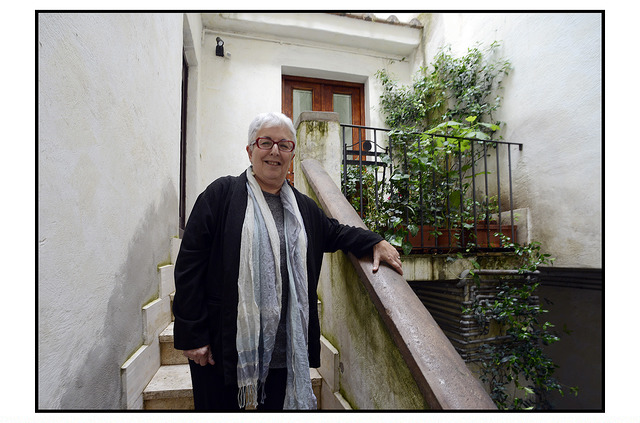 They are willing to offer their energy and their skills to give international readers the opportunity of learning more about the Italian Jewish world, its values, its culture and its traditions. In spite of all our efforts to avoid this, readers may find an occasional language mistake. We count on your understanding and on your help and advice to correct these mistakes and improve our publication. You received this newsletter because you authorized UCEI to contact you. If you would like to remove your email address from our list, or if you would like to subscribe using a new email address, please send a blank email to desk@ucei.it stating "unsubscribe" or "subscribe" in the subject field. © UCEI - All rights reserved - The articles may only be reproduced after obtaining the written permission of the editor-in-chief. Pagine Ebraiche - Reg Rome Court 199/2009 – Editor in Chief: Guido Vitale. Special thanks to: Francesco Moises Bassano, Susanna Barki, Amanda Benjamin, Monica Bizzio, Angelica Edna Calò Livne, Eliezer Di Martino, Alain Elkann, Dori Fleekop, Daniela Fubini, Benedetta Guetta, Sarah Kaminski, Daniel Leisawitz, Annette Leckart, Gadi Luzzatto Voghera, Yaakov Mascetti, Francesca Matalon, Jonathan Misrachi, Anna Momigliano, Giovanni Montenero, Elèna Mortara, Sabina Muccigrosso, Lisa Palmieri Billig, Jazmine Pignatello, Shirley Piperno, Giandomenico Pozzi, Daniel Reichel, Colby Robbins, Danielle Rockman, Lindsay Shedlin, Michael Sierra, Rachel Silvera, Adam Smulevich, Simone Somekh, Rossella Tercatin, Ada Treves, Lauren Waldman, Sahar Zivan. Questo notiziario è realizzato in condizioni di particolare difficoltà. I redattori di questo notiziario sono giornalisti italiani di madrelingua italiana. Mettono a disposizione le loro energie e le loro competenze per raccontare in lingua inglese l'ebraismo italiano, i suoi valori, la sua cultura e i suoi valori. Nonostante il nostro impegno il lettore potrebbe trovare errori e imperfezioni nell'utilizzo del linguaggio che faremo del nostro meglio per evitare. Contiamo sulla vostra comprensione e soprattutto sul vostro aiuto e sul vostro consiglio per correggere gli errori e migliorare. Avete ricevuto questo messaggio perché avete trasmesso a Ucei l'autorizzazione a comunicare con voi. Se non desiderate ricevere ulteriori comunicazioni o se volete comunicare un nuovo indirizzo email, scrivete a: desk@ucei.it indicando nell'oggetto del messaggio "cancella" o "modifica". © UCEI - Tutti i diritti riservati - I testi possono essere riprodotti solo dopo aver ottenuto l'autorizzazione scritta della Direzione. Pagine Ebraiche International Edition - notiziario dell'ebraismo italiano - Reg. Tribunale di Roma 199/2009 - direttore responsabile: Guido Vitale. 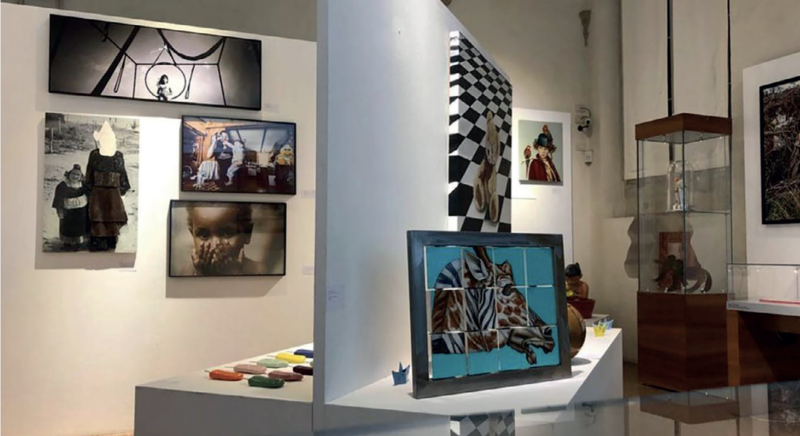 Realizzato con il contributo di: Francesco Moises Bassano, Susanna Barki, Amanda Benjamin, Monica Bizzio, Angelica Edna Calò Livne, Eliezer Di Martino, Alain Elkann, Dori Fleekop, Daniela Fubini, Benedetta Guetta, Sarah Kaminski, Daniel Leisawitz, Annette Leckart, Gadi Luzzatto Voghera, Yaakov Mascetti, Francesca Matalon, Jonathan Misrachi, Anna Momigliano, Giovanni Montenero, Elèna Mortara, Sabina Muccigrosso, Lisa Palmieri Billig, Jazmine Pignatello, Shirley Piperno, Giandomenico Pozzi, Daniel Reichel, Colby Robbins, Danielle Rockman, Lindsay Shedlin, Michael Sierra, Rachel Silvera, Adam Smulevich, Simone Somekh, Rossella Tercatin, Ada Treves, Lauren Waldman, Sahar Zivan.